Grab a Pen, Get a Front-Row Seat & Press Play. Life-Change Starts Here! 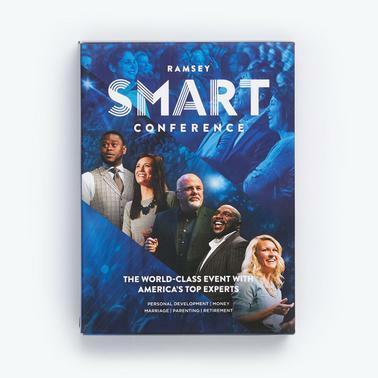 For the FIRST TIME EVER, you can experience the life-changing impact of our most popular live event on DVD and stream it on-the-go. Enjoy the power-packed talks that have challenged audiences to get serious about their lives. It's time to break out of normal and find deeper purpose for your life. "The late Zig Ziglar used to talk about the Wheel of Life. It's a chart that divides life into seven spokes: mental, spiritual, physical, family, financial, personal and career. The idea is that since God created us to succeed in all of these areas, we need to grow in each of them. The wheel reminds us that no one was made to just take up space. But while we all have potential for personal growth, we also struggle—and trouble in one area usually spells trouble for the others. That's what makes the Smart Conference experience so great! In these videos, you won't just hear from one speaker on one topic. You'll get world-class guidance from experts in every spoke of life. These folks understand your pain points, and they helped others discover healing and purpose. Along with the DVDs, you can also use your own personal access code to stream the videos on your favorite mobile device. You can literally carry these experts with you wherever you go! I don't know where you're struggling. But I do know these messages will challenge and inspire you. More important, they'll help you break free from the chains that have held you back. You were created for more. And the journey starts here!" Take your front-row seat with you anywhere! Watch from home on DVD or stream it on-the-go with your own online access code. These DVDs are power-packed with 4 ½ hours of talks from 8 leading experts in money, leadership and personal development. Don't get too comfy, these dynamic speakers will have you at the edge of your seats! Stay focused and engaged with 2 action-packed workbooks. You’ll receive one workbook for yourself and one to share. Why 2? Because the lessons you'll hear from these world-class speakers are just too good to keep to yourself! These workbooks follow along the 3 DVDs and help you take this proven plan and put it on paper, so you can turn these lessons into personal goals, and turn these personal goals into reality. This is a powerful story that Dave wants you to hear directly from him. His path to teach these money principles is only part of his story. Dave has no problem talking about his faith—and how his faith relates to his money. But it hasn’t always been that way. Now, you can hear Dave's story in his own words. Since 2003, Anthony ONeal has helped thousands of students make good decisions with their money, relationships and education to live a well-balanced life. He’s the National Best-Selling Author of Graduate Survival Guide: 5 Mistakes You Can’t Afford to Make in College, and travels the country spreading his encouraging message to help teens and young adults transition into the real world. Meg Meeker, M.D., is an expert on child and family dynamics, best-selling author, and associate professor of medicine at Michigan State School of Human Medicine. A popular speaker on child-parent relationships, she is a frequent guest on nationally syndicated radio and television programs. Meg and her husband Walter reside in northern Michigan and have four children. Dr. Henry Cloud is an acclaimed leadership expert, psychologist, and best-selling author. He draws on his extensive experience in business, leadership consulting, and clinical psychology, to impart practical and effective advice for improving leadership skills and performance.